Those chocolate tahini cookies from yesterday were so good, I’m using up the end of the jar of tahini to make more! I’ve only got about 100ml of tahini left, so some changes are needed. Plus I was planning to use honey in yesterday’s batch, as my Flavor Bible says that’s a good flavour match, but I forgot! Also I’m going to use white sugar, rather than golden, for extra crunch (the molasses in the golden version makes things chewier). Finally I’m doubling the baking powder in the hope of getting more cracking (I hope that’s not too much!). And as mentioned yesterday, 16 minutes cooking time at 160C fan, turning half way through. 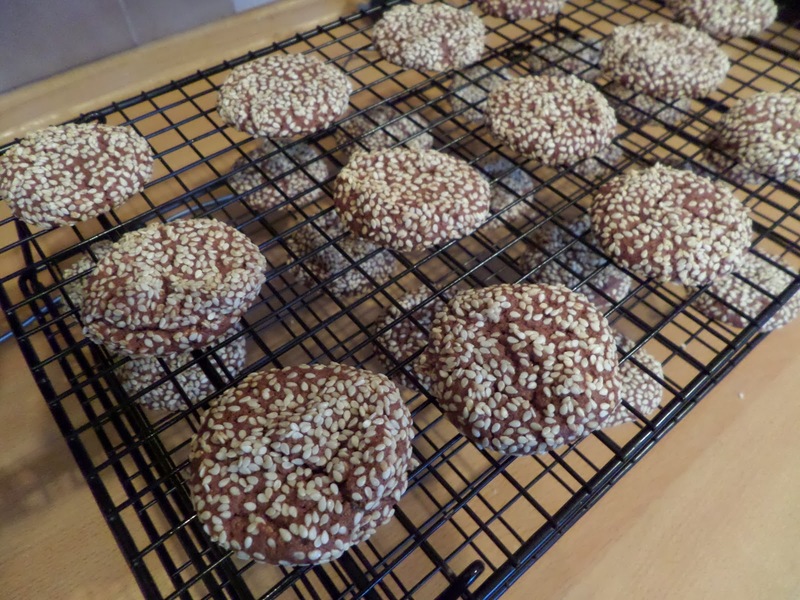 So they didn’t crack more… so the extra baking powder didn’t do what I wanted :( They are slightly crispier, so the white sugar worked :) The texture isn’t as much like halva, but the honey flavour really works. I can’t decide which batch I like better!